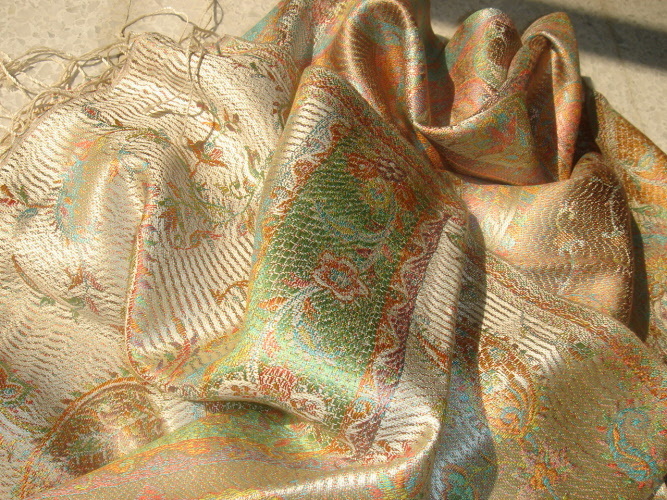 The term "Pashmina" nowadays is being used as a general term for shawls of a very high quality. Officially you are only allowed to call a shawl "pashmina" when it is produced of genuine "pashmina wool". But most people do not follow that criteria any more. The word pashmina became the term for a shawl of outstanding quality produced of natural fibers, very often with traditional indian design. Such a shawl is a must have fashion accessory. The pashmina shawl has style and class. The shawl is very comfortable and very easy to combine with any outfit for any weather. Its nice on a summer evening, as well as very warm in winter. Actually a shawl should be part of anybody's wardrobe. Its nice for colder days to use one in addition or as replacement of a jacket. You can snuggle in your shawl and feel warm and secure. That is why a shawl is a perfect gift item for anybody; as you can never have enough shawls in your closet. The word pashmina comes from the Persian word "pashm", that means wool. This wool is being shaved from the lower part of the stomach of the special mountain goat, which is often referred to as the pashmina goat. These goats live high in the mountains, 4000 meters and above, of the northern part of India as well as in Nepal. To protect themselves from the cold, they have thick warm hairs. The hairs just below the chin as well as on the lower part of the stomach are the softest ones, and hardly exposed to the elements. Only these soft hairs are being used to produce the Pashmina shawl. It has to be noted however that very often a little bit of silk is blended with the wool yarns, in order to gain strength, win in durability and give the shawl a shiny finishing.